To enhance the quality of life for people in the Gert Town Community. The purpose of the Gert Town Community Fund, a Donor Advised Fund of The Greater New Orleans Foundation, is to enhance the quality of life for people in the Gert Town Community. An advisory committee of business and civic leaders meet annually to review grant requests in various program areas. Program areas include: children and youth; housing; older adult services including transportation; community leadership capacity building; adult education; and legal services (successions, taxes, or other housing matters).. In addition, the committee is interested in community beautification projects (i.e. tree planting, greenspace maintenance, and neighborhood cleanup). Only ONE application per organization will be accepted. The Fund will support nonprofit organizations that serve the Gert Town Community. Please see the map below or contact The Greater New Orleans Foundation for more details on the geographical boundaries for the fund. If a grant is awarded, the grantee is required to submit interim and final programmatic and financial reports outlining the use of grant funds and the impact of the grant on Gert Town residents and the community. Click here for reporting guidelines. 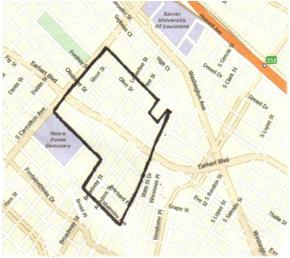 Approximate boundaries: the geographic granting area is roughly from South Carrollton Avenue on the west side (between Fig and Edinburgh streets) to College Court on the east side (between Walmsley and Clio streets).